The ultimate challenge in the race to miniaturize light emitting diodes (LED) has now been met: a team led by the Institut de Physique et de Chimie des Matériaux de Strasbourg has developed the first ever single-molecule LED. The device is formed from a single polythiophene wire placed between the tip of a scanning tunneling microscope and a gold surface. It emits light only when the current passes in a certain direction. This experimental tour de force sheds light on the interactions between electrons and photons at the smallest scales. Moreover, it represents yet another step towards creating components for a molecular computer in the future. This work has recently been published in the journal Physical Review Letters. Light emitting diodes are components that emit light when an electric current passes through them and only let light through in one direction. LEDs play an important role in everyday life, as light indicators. They also have a promising future in the field of lighting, where they are progressively taking over the market. A major advantage of LEDs is that it is possible to make them very small, so point light sources can be obtained. 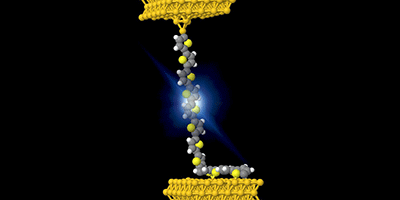 With this in mind, one final miniaturization hurdle has recently been overcome by researchers at IPCMS in Strasbourg, in collaboration with a team from the Institut Parisien de Chimie Moléculaire (CNRS): they have produced the first ever single-molecule LED. To achieve this, they used a single polythiophene wire. This substance is a good electricity conductor. It is made of hydrogen, carbon and sulfur, and is used to make larger LEDs that are already on the market. The polythiophene wire was attached at one end to the tip of a scanning tunneling microscope, and at the other end to a gold surface. The scientists recorded the light emitted when a current passed through this nanowire. They observed that the thiophene wire acts as a light emitting diode: light was only emitted when electrons went from the tip of the microscope towards the gold surface.. When the polarity was reversed, light emission was negligible. In collaboration with a theoretical team from the Service de Physique de l'Etat Condensé, the researchers showed that this light was emitted when a negative charge (an electron) combined with a positive charge (a hole) in the nanowire and transmitted most of its energy to a photon. For every 100,000 electrons injected into the thiophene wire, a photon was emitted. Its wavelength was in the red range. From a fundamental viewpoint, this device gives researchers a new tool to probe phenomena that are produced when an electrical conductor emits light and it does so at a scale where quantum physics takes precedence over classical physics. Scientists will also be able to optimize substances to produce more powerful light emissions. Finally, this work is a first step towards making molecule-sized components that combine electronic and optical properties. Similar components could form the basis of a molecular computer.